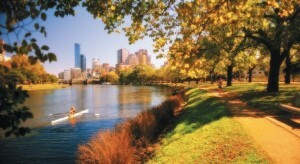 Discover the calm waters of the Yarra River! Why not drive your way to a scenic cruise of the Yarra River? Even when conditions in the bay get rough, Yarra waters just flow along. Go past South Bank, the Crown Casino, the MCG and right up to the Yarra Bend. Stop off at Herring Island and settle on a picnic spot. Boat license is not required. Full instruction, safety gears and fleet support are provided for adults and kids. Boat 4 Hire crafts can take up to five adult passengers. A half day rate from $150 is an affordable day out for the whole family. The kids will surely love it and pets are allowed, too! Boat 4 Hire operates even in strong windy conditions, other boat hire companies can’t. So, discover a new side of Melbourne and go cruising today! Book ahead and avoid the rush!